Reflecting this, the models embodied a series of separate characters, inspired by the style stereotypes captured by Ari Versluis and Ellie Uyttenbroek in their famous long-standing project Exactitudes – where individual portraits are grouped together to reveal the sartorial similarities that define certain groups or subcultures. In the show, as in the book, each archetype had a name, as well as their own individual story. “We really got into the details of their lives, how they wear things,” Gvasalia said post-show. First to enter the runway via one of the Pompidou’s escalators – as if taking the Metro or descending into a homogenous shopping centre somewhere – came the wealthy older woman, her fur coat to her knees, oversized sunglasses shielding her eyes. Soon she was followed by the chic Parisienne with a trench coat, heels, and Vespa helmet; the tourist with rain jacket and backpack strapped around his waist; the at-your-service secretary, played by stylist Lotta Volkova – even the groom at a wedding in a cheap suit, his tie hanging limply from his breast pocket like it might at the end of the night. 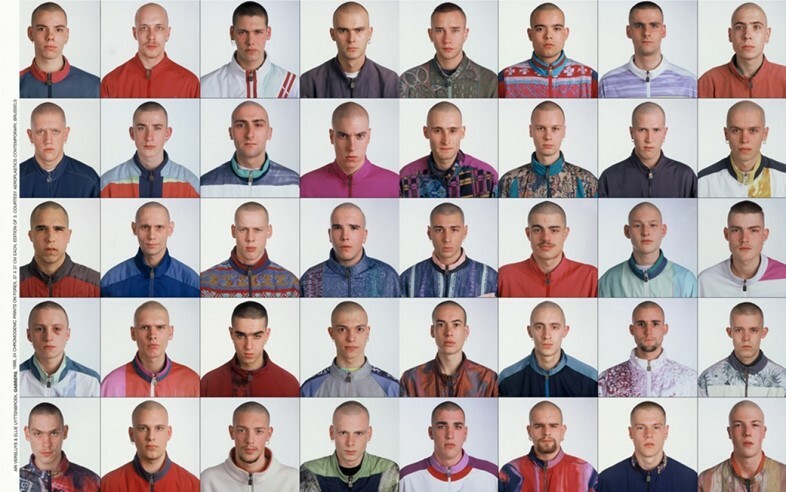 There was a whole gang of members from assorted subcultures: the punk, in a jacket Gvasalia had been up until 4am painting; the emo, complete with straightened dyed black hair and studded belt; the gabber, the thrash metal fan, the metalhead. For the final walk they all marched together, like a crowd in the street, each with their own purpose, lifestyle, destination. The casting – the most diverse from the brand yet, with models of different ages, races, and sizes – reflected this, with some plucked from the streets as late as the night before the show. “Yesterday evening we went to some bistros to look for Giancarlo characters, until really late yesterday night,” said Gvasalia. “It was interesting. We never do casting like this way. Most of them never did shows.” So accurate were the portrayals that it felt occasionally uncanny – you could believe that the bouncer had a shift at the club later, could imagine sitting next to the pensioner in his corduroy trousers and padded vest on a bus. Of course, they weren’t simple copies of what you might find out in the real world. “It was really turning those archetypes into Vetements, what Vetements would do with it conceptually,” Gvasalia asserted. The cast were given the brand’s signature spin – denim was deconstructed, trousers connected straight into high heels, and one character, the buttoned up Ulrich, even carried a particularly brilliant black leather Vetements Bible. 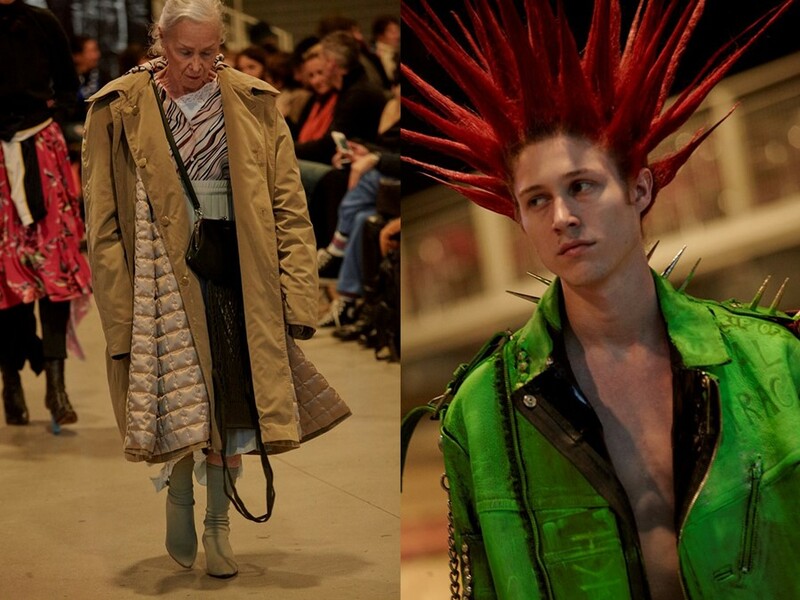 Subtle nods to the world at large were also present – like the punk’s anti-fascist and pro-queer slogans, and the Vetements vagabond (sure to ruffle some feathers) who wore a European Union sweatshirt Gvasalia described as “decomposing”.